If you or a friend are planning on breastfeeding and may want to do so discreetly in public, a nursing cover is a great DIY project. Not too experienced with sewing? The cover is practically just hemming. I made one for a friend and spent about $6 for all the supplies to make one; to buy a cover it can cost on average, $15-$35. 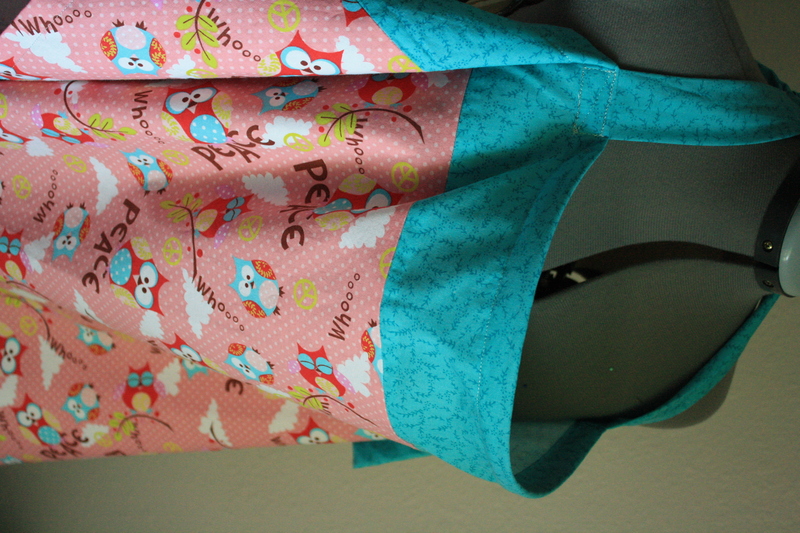 I found this nursing apron tutorial at Prudent Baby. Of all the ones I came across, this one seemed the best. Plus the step by step picture tutorial really helps! Want to do two different fabrics? Keep the length measurement for both fabrics (38″), split the width measurement (26″) between your two fabrics and add 1/2 inch to both for seam allowances.You can cover the seam that joins the two fabric with ribbon or ric-rac. Visit Prudent Baby for detailed instructions on how to make your nursing cover! I enjoyed my first shirt refashion from a way-too-big shirt and deemed the girly ruffly bib a success, so I wanted to do another shirt refashion. I used the same sizing technique I used HERE. But instead of shortening the sleeves at the end and re-hemming, I shortened the sleeves from where they are sewn to the shirt, that way I didn’t have to hem them! What did I do, and how can you make one too?